This clip shows how you can create multi lingual reports with BI Publisher using its advanced industry leading translation framework. With BI Publisher, creating translation for your report is easy and simple, and the cost of the maintenance is dramatically reduced. If you want to display OBIEE 11G content in any other portals using IFrames, You will end up with a message “OBIEE content cannot be displayed in an IFrame”. Because In OBIEE 11G, Oracle added framebusting check, to avoid the clickhacking security atatck. To control the IFrame rendering we need to add the following tags in instanceconfig.xml within security key and restart the OBI Presentation Service. 1. prohibit: Never allow OBIEE 11G content to be rendered in IFrame. 2. sameDomainOnly: Allow rendering in IFrame if enclosing page was generated by the server in same domain. 3. allow: Always allows in-IFrame rendering. So based on your requirement you need to change/add the IFrame bursting configurations to your OBI Presentation Server. After this, Navigate to <Middleware_Home>\oracleBI1\bifoundation\web\app\WEB-INF\ and open the ‘web.xml‘ file. Add the following highlighted entry to the file. Restart all OBIEE 11G services to reflect these changes in application. After you migrate your RPD and Web Catalog t new environment,it is best practice to update the user GUIDs. If the same user name exists in both directory servers (original and new), then the original user GUID might conflict with the user GUID that is contained in new directory server. A refresh forces the system to reference the user GUID that is contained in the new directory server. Authentication errors might result if the GUIDs are not refreshed and the system detects a mismatch for the user GUID. And even after GUIDS referesh OBIEE 11g System will cache the UserID in webcatalog and always the cached ID will be callup instead of new GUID for User.This wrong GUID calling will leads to Authentication failure errors. Sometimes we can delete the user and recreate to solve this. But, This recreation of same user again miss its ID reference for Catalog objects.And We will end up with Missing My Folders and other objects. Because OBIEE 11G maps the RPD objects and Catalog objects based on system assigned GUID.To solve this we need to validate the Useraccounts to map the OBIEE RPD and Catalog object links. 3) Save the file and re-start all of the BI Services through Enterprise Manager. 4) Now yo should be able to login to OBIEE 11g and you can see all your artifacts like My Folder content. Once resolved, dont forget to remove the settings used to clean up the Cached catalog accounts in instanceconfig.xml. Restart the services. Test the login to make sure there are no issues. 3. Save the file and re-start all of the BI Services through Enterprise Manager. Now you should be able to export more than 6500 records to excel. When OBIEE 11g (11.1.1.3.0) released it has so many bugs including some spell mistakes too. Somebody might have got patches from oracle support for those issues. Mostly, all of them are fixed in new OBIEE 11.1.1.5.0 release. for benefit of OBIEE supporters I am listing out full list of bugs fixed in OBIEE 11.1.1.5.0 release gathered from Oracle support. 10229397 CANNOT SAVE REQUEST USING STANDARD DATE FORMATS. 10337649 PIVOT TABLE SHOWS BUTTONS FOR SORTING ON CALCULATED ITEMS. 9540009 UNIXCHK.SH ENCOUNTERS HOST NOT FOUND ERROR WHEN DNS IS NOT AVAILABLE. Bug 9381019 XMLP ROLES NOT HONORED WITH SSO ENABLED FOR AD SYNCHED USERS. Bug 10231671 MDX QUERY WITH NAMED SETS NOT RETURNING EXPECTED RESULTS. Hope this post helps you to find the fixes for OBIEE 11G product. And these information can be all available through the database tables so you can use BI Publisher to generate your Auditing reports or visualize the data to gain more insights about how your users are doing on your reporting platform. During my 11G journey am frequently asking for “How to upgrade new OBIEE 11.1.1.5.0 on top of OBIEE 11.1.1.3.0” i.e. In-Place-Upgrade. So thought of writing a post on this topic today. Hope this helps you in your executions. When we are moving from OBIEE 11.1.1.3 to 11.1.1.5 there are two ways to upgrade our environment. out-of-place upgrade : This is quite simply installing new OBIEE 11.1.1.5.0 by uninstalling 11.1.1.3.0 or maintaining two Middleware homes. in-place upgrade : This upgrade operates on existing files. Moving from one 11g release to another 11g release. The advantage of this is we can still have custom configurations which are configured in 11.1.1.3.0 version. Because technically this just upgrade the new BI binaries not the configurations. As you all know how to do the out-of-place upgrade. Today am going to explain about in-place upgrade. 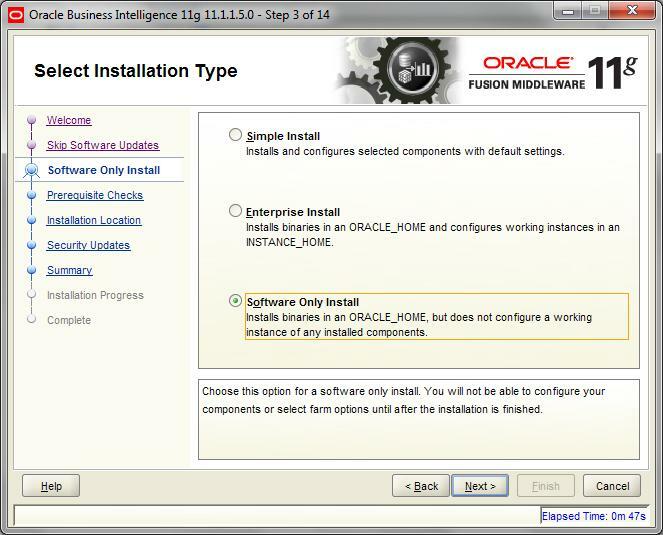 Run the Oracle BI Product Installer, and perform a Software Only installation, specifying the existing Middleware home to be upgraded. Run the Patch Set Assistant for each of the Oracle BI schemas created with RCU. Stop all WebLogic Servers, Node Manager, OPMN, and OPMN-managed system components that are part of all Oracle BI domains that use the Middleware Home that you must upgrade.On Windows systems, also stop the component that is called Oracle WebLogic NodeManager (name). With OBIEE 11.1.1.3.0 installation we will have WebLogic Server (WLS) is 10.3.3. But the new OBIEE 11.1.1.5.0 requires weblogic 10.3.5. so you need to upgrade this to 10.3.5 before installing/upgrading OBIEE. 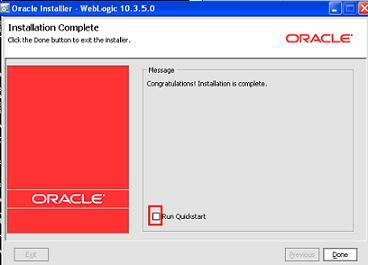 In order to upgrade weblogic you will need this 10.3.5 upgrade version of WLS, which you can download from Oracle Metalink site. 2. Accept all the default values and keep ‘Next’ till end, and start the upgrade. Once the upgrade process completes you’ll see the following window. But don’t select Run QuickStart checkbox and click Done button. Download the OBIEE 11.1.1.5 version from OTN page. 3. 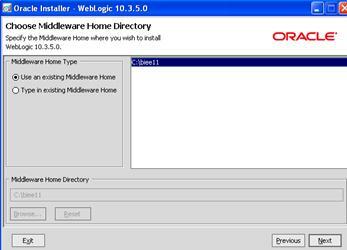 Select your original Middleware Home where you installed OBIEE 11.1.1.3. 4. Click ‘Install’ button to start the installation. You need to upgrade the BIPLATFORM and MDS Schemas. Run the Patch Set Assistant for each of the Oracle BI schemas created with RCU.Update the MDS schema first. This step is required for any system component that is associated with a WebLogic domain. After you have patched your system component software that is associated with a WebLogic domain, you must run E:\MW\Oracle_BI1\opmn\bin\upgradenonj2eeapp.bat (on Windows operating systems) script to update your system components. The Administration Server is up and running. The OPMN instance in the bin directory in the Instance home is up and running. Here is the syntax for the ‘upgradenonj2eeapp.bat command. For each WebLogic Server domain, you must run the updateJRF() WLST command to update the shared libraries in your domain. Before you do this, you need to stop all running instances, Managed Servers, Administration Server, and Node Manager in the domain. For each WebLogic Server domain, you must run the upgradeOpss() WLST command to update your configurations and stores from previous releases to Release 11.1.1.5.0 configurations and stores using a system-jazn-data file in Release 11.1.1.5.0. You can use ‘upgradeOpss()’ WLST command. Here is a syntax for the command. The ‘existing jps-config.xml file can be found under E:\MW\user_projects\domains\bifoundation_domain\config\fmwconfig\jps-config.xml and the ‘system_jazn_data_file’ can be found under E:\MW\oracle_common\modules\oracle.jps_11.1.1\domain_config\system-jazn-data.xml. If you are updating to the latest version of Oracle Business Intelligence (BI) from Release 11.1.1.3.0, you must run the bi-upgrade.py script in each Oracle BI domain. This script configures the code grants necessary to ensure that SSL works correctly for Oracle BI, and must be run even if SSL is not used. And if you have multiple BI domains (Enterprise deployment) then you need to run this on each domain. This is to upgrade OWSM (Oracle Web Service Manager) policy repository, you can use WLST command ‘upgradeWSMPolicyRepository()’. In order to run this command you need to have your WebLogic Server up-and-running. Here is an example. Shut down Oracle BI Presentation Services using Oracle Enterprise Manager. Back up your Release 11.1.1.3.0 catalogs by using the 7-Zip utility to create a compressed file for it. Create a backup copy of the instanceconfig.xml file. The instanceconfig.xml file is located in the E:\MWH\instances\instance1\config\OracleBIPresentationServicesComponent\ coreapplication_obips1. Change the upgradeAndExit option to true in the instanceconfig.xml file. After the catalogs are updated, edit the instanceconfig.xml file again and change the upgradeAndExit option back to false. 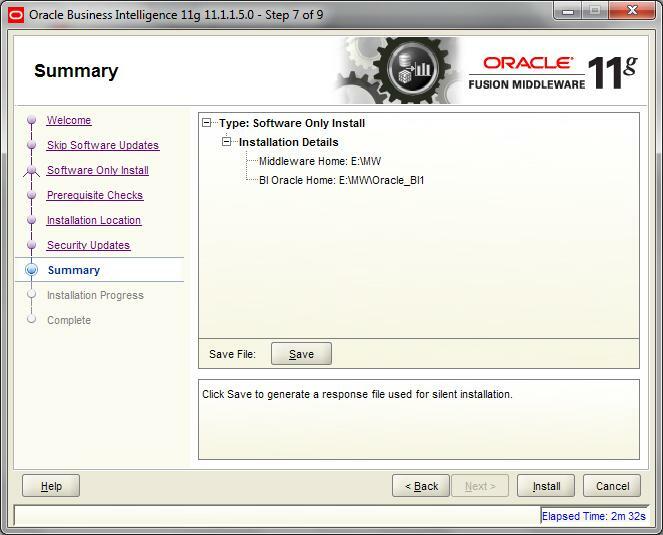 Restart Oracle BI Presentation Services using Fusion Middleware Control. Login to analytics and make sure it’s working fine.